Leather and suede garments are an investment which should be cleaned by skilled professionals. At Ad Astra Wet & Dry Cleaning, we understand how precious your leather and suede garments are to you. They may carry sentimental value, not to mention their superior quality and cost too. As the leading dry cleaners specialising in leather, we understand that great care and professional skill is needed when working with leather and suede. We recommend that routine cleaning of your leather or suede garments be undertaken to ensure their longevity, and have your jackets or other materials looking brand new all year round. 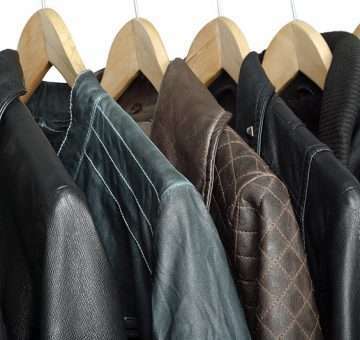 As the go-to leather dry cleaners in Perth, we welcome any leather, suede, or skin garment such as coats, jackets, suits, waistcoats, skirts, trousers, and motorcycle cycle leathers that are in need of a bit of TLC. Leather cleaning is a specialised process that is designed to preserve the look and feel of the leather garment. Leather garments are extremely durable and if properly treated and cared for, will last a lifetime. At Ad Astra, we assess each leather or suede item individually to decide upon the necessary treatment program required. Our cleaning specialists will handle most stains with professionalism, whilst preserving the natural appearance of your suede or leather garment. The cleaning of leathers and suedes can take over a week to complete, as it is a delicate and specialised process. We require you to complete a Consent to Clean form, which gives us both consent and a host of other information we need in order to treat the stain or garment efficiently. Here’s all you need to know about what to expect after your leathers are cleaned. Ad Astra is known as the best dry cleaners that clean leather in Perth, why use anyone else? Contact us today and we guarantee you won’t be disappointed.